Web Partner Review 2019: Is Web Partner a Good Hosting? South African company Web Partner aims to be your partner for everything from web design to website hosting. If you don’t want a complete web design and hosting service, you can choose one of its three simple hosting plans provided in partnership with Hetzner. For almost a decade, Web Partner has been one of South Africa’s leading digital agencies specializing in web design, e-marketing, e-commerce, web development, and SEO. Its team of 30 design experts takes pride in having completed more than 5,000 projects. For those who don’t want the full website design-to-deployment service, Web Partner partners with another provider to offer a simple set of three web hosting plans along with domain registration. If you’re looking for a simple Linux-based web hosting service, you’ll be pleased with what the Hetzner partner hosting plans have to offer. But as an absolute beginner, you might be disappointed by there being no auto-installer and no website builder on offer. 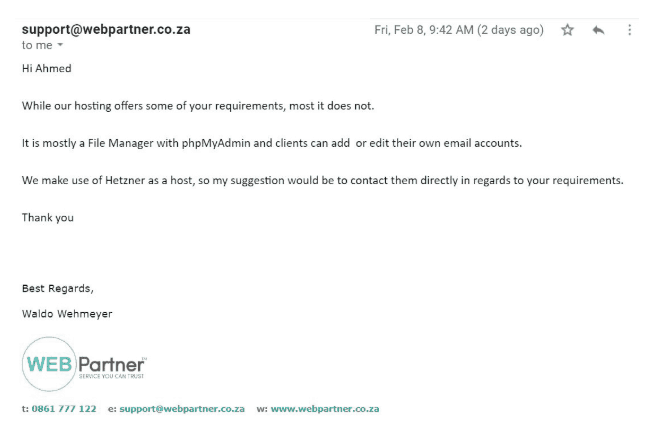 Basically, you get a file manager with the phpMyAdmin tool that gives you the ability to add and edit email accounts. If you’re looking to have a modern, professional website designed, built, and hosted, then you’ll want to check out Web Partner’s complete website design packages. These come with free domain transfers, domain registration, CMS hosting, rich galleries, large slideshows, and daily backups. Web Partner’s pure web hosting plans are relatively limited. There are just three plans – Basic, Business, and Advanced – that differ in disk space, email accounts, FTP accounts, and MySQL databases. Plans are priced in local South African currency (so consider the exchange rate), and the non-refundable monthly contracts come with no free trial. In addition to Web Partner’s minimal FAQ page, there are two ways to get support from the company: telephone or email on business days. Based on my two interactions with the support team, I’d say that they’re not quite as responsive as I would like, but they are helpful and knowledgeable. I have no doubts that Web Partner is one of the most experienced web design agencies you will find, but its basic web hosting services might not appeal to tech-savvy developers and advanced users. The hosting plans may be more suitable for startups looking for affordable hosting, but not if you want beginner-friendly tools like a website builder and one-click installer. Put simply, Web Partner’s real value probably lies in its end-to-end design and hosting offerings. You might make Web Partner your partner for combined web design and hosting. 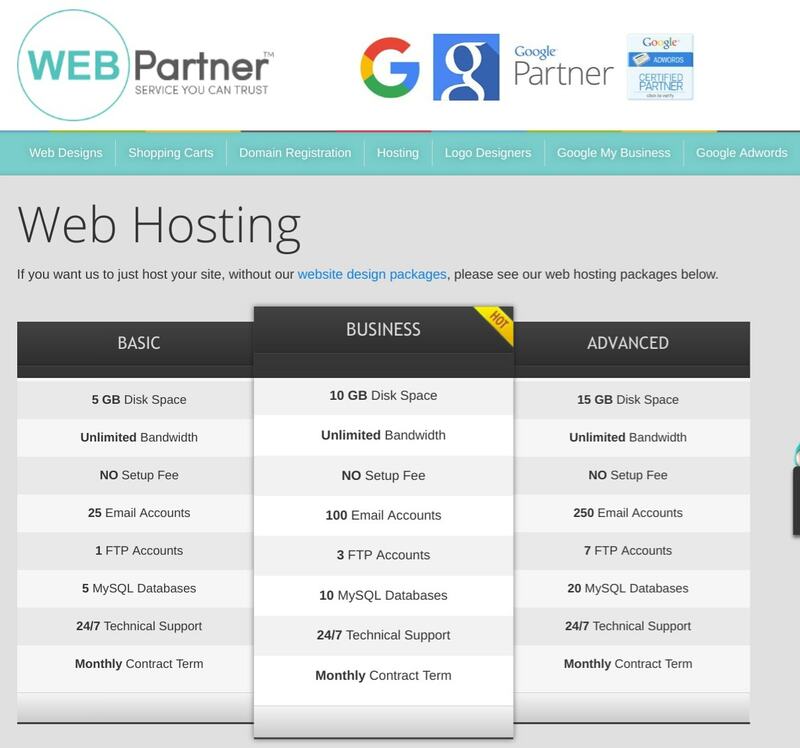 Wondering how Web Partner stacks up against other Web Hosting companies? Enter any other Web Hosting company and we will give you a side-by-side comparison.